Continuing on with a bunch of catch up posts on various projects this weekend when I found some time to write, I haven’t completely ignored my first almost fully 3D printed passenger car (I say almost as the underbody details as discussed in Part 2 are commercial detail parts). Its been sitting waiting on a few major things which I’ll get to below, but since my last post, I have decaled the car and clear coated the body. As you can see in the images below, the car is starting to look the part of it being in service in the 1950’s era of its life. 3D printed Nova Scotia, detailed based on pictures of the car in the 1950’s, or about half way through its life from Construction in 1896 to being a part of the TRM collection today in 2016! Tonight I’ve been fixing some issues that have arisen, like the floor that didn’t set flat when I originally glued it into the interior. I’ve also been preparing glass for the windows so I can get them done. Where the car needs help, should be pretty obvious from the pictures above, there are two observation platforms where there are no railings. I did draw and 3D print railings, but I’ve come to the conclusion that they are too flimsy to hold up to any kind of handling, and I’m not even sure they are strong enough to survive an attempt at painting them. The obvious solution is to re-draw them and get them made as etched brass parts, at least it was the obvious solution until I saw on the BGR Group website (BGR is a small manufacturer of resin kits of Canadian Passenger cars. I’ve built one, and they are fantastic kits, but not for beginners!). In July, John Newland who runs BGR posted that he has received brass etches of the Canadian Pacific Railway observation railings for the 6611 series Buffet/Parlour/Observation cars. Based on the pictures I’ve found online, the CPR ornate railings on these cars are the same as those fitted by the DAR (a CPR subsidiary) to Nova Scotia that are still on one end of the car today. My problem, I haven’t been able to reach John to find out if he is able/willing to sell etches of just the railings and not the full car kit. Hopefully, he’ll be at one of the upcoming shows through the winter and I can speak to him in person about them. The second big task is an interior of some sort. The car as it arrived at the Toronto Railway Museum was heavily modified as part of the former Ossawippi Express Restaurant in Orillia. As such, I don’t really know what the interior layout was, and I haven’t been able to find any plans. I have a couple of people who were Upper Canada Railway Society (UCRS) members in the 1960’s when that group existed and owned the car for excursions, to see if they ever published a plan in their newsletters, but so far, no luck. I can guess based on window patterns and locations, but it would be nice to have a plan and be a bit more accurate if I can. For now, I’m going to get the windows installed, and probably wind up putting the car back up on the shelf for a couple of months while I work on the railing and interior questions. A couple of weeks back I wrote about the Tiny 3D printed GO F59PH and Via LRC locomotives I was working on. I’ve now finished them, and have the GO train placed on the model of “The Railway Village” in Roundhouse Park Toronto which is part of the Toronto Railway Museum. I’m not sure where the VIA train is going to go, as the model was getting overcrowded with mini trains. The railway village model includes several 3D printed structures, some scenery and a stretch of full-scale track, along with some 7.5″ gauge miniature railway. Worlds Smallest GO Train at the platform at Don Station in HO Scale. A maybe someday future train for the Toronto Railway Museum. The worlds smallest GO Train is a bit of a speculation. One thing that happens at railway museums when you get a bunch of people together who love trains and are into preserving and restoring them, is they start talking about what they’d like to acquire. Top of the list in Toronto is almost always a GO Transit F59ph locomotive. These workhorses formed the entire GO locomotive fleet from shortly after their introduction in 1988 untill their replacements started arriving in 2007. There are still a handful in GO Transit service, but most have been retired and sold on. Whenever the talk turns to what the museum volunteers would like to have, GO Transit equipment comes up as it is how most people in Toronto for the past 50 years have ridden the rails, and it’s what most kids see when they see trains around Toronto, and the TRM doesn’t have any. Personally, I want one of the original bi-level cab cars, but an F59PH is cool too! With that in mind, the miniature F59 and GO painted riding cars above are a bit of speculative fiction, as while the museum may not be able to get a 1:1 scale GO Train, building a miniature one would be a close second, and probably more likely in the short-term! As for the model of the railway village, it’s a project that’s been going for a couple of years. I talked about it here in a post on making the hobby work in apartment sized spaces. View of Cabin D, Cabin D’s toolshed, and the John Street Crossing Shanty on The Railway Village model. The structures are all at least partly 3D printed. Having access to the buildings made it “easy” for me to physically measure them and prepare the 3D models. They don’t however, come fully finished, they come as the bones, and need to have flat roofs, shingles, paint and detailing done. As I’ve said before, 3D printing is a tool, it gets you some of the way there, but you still need to know how to build a model to get it across the finish line. What a 3D printed Don Station looks like before you prime, paint, add details and complete it. Outside the 3D printed buildings, everything else about the model is pretty traditional model railroader stuff. Plaster, strip wood, ballast, ground cover, styrofoam to create the hill, all normal things that almost every model railroader will have used if they’ve built a layout, module or diorama. Overview of the Railway Village model nearing completion. The miniature trains have now been fixed in place. As you can see from the pictures, I still have some work to do. I need to add some more people standing around, taking pictures, and animate the scene. I also, most glaringly have some very dead looking birch tree models. The armatures are my own, produced to the techniques discussed in Gordon Gravett’s “Modelling Trees” and taught to me by Trevor Marshall, but I haven’t managed to get around to doing the canopy and making them look like trees. I don’t think there’s any specific reason other than I keep looking at it as something new, and putting it to the side as I feel I want a long uninterrupted block of time to work on them, and 2016 hasn’t been the year for that. I want to have this model closer to done by early 2017 for some shows, so I really need to work myself up to the trees! For now though, after a productive day working on the diorama, its got to go back beneath its protective box to keep the cat off of it. My friends who are not model railroaders always look askance when I tell them I’ve just spent $100 or $200 on a locomotive or car and that the first thing I am going to do is cut it up. One of my friends is genuinely amazed that someone who can be as frugal as I can be on some things (I’m not going to lie, I stretch as much life out of clothes as i can to avoid having to go to the mall and buy new dress shirts!! ), but merrily sit at my desk and slice apart a $200 engine. It’s just a part of the hobby, it comes with the territory if you like building things and want to model things that are not otherwise available. Dissassembling Skarloey, a perfectly good model to modify it to something else. One of the fiddlier dissasemblies as its tiny compared to the HO scale standard gauge models I’m used to. I introduced my project to modify a Bachmann Thomas & Friends Skarloey to the Talyllyn Railway’s No.1 “Talyllyn” here. This project at a minimum involves completely disassembling a brand new locomotive, ripping off the Thomas face, and re-painting it. On top of this, i am making some additional modifications to make a better looking model. The die-cast body shell has a large flat surface that blocks the cab windows from being open. I have cut this piece of metal off, and have drawn up a 3D representation of the boiler backhead to go in its place. It’s not 100% accurate, but at the scale it is going to be, once it is painted and an engineer/fireman figure are shoehorned into the cab, it will look much better than either the blank wall with blocked off windows, or nothing at all. Shapeways Render of the backhead design for Tallylyn, the locomotive Skarloey is based on. This will also be tiny when it arrives, which is hopefully next week with an order from Shapeways. The second big change, is that on every picture i can find, there is coal piled on the left hand side of the cab, but not on the right. The model has coal on the right hand side, so i’ve been gently filing and cutting away the die-cast pile of coal until i get it flush with the water tank and can then putty in the gaps to create a flat surface. This is tricky as any mis slip with a file or saw will hack away detail i want on the saddle tank. Shot showing the cut off cab interior from the locomotive and the filed down coal pile. Next step is to get the parts that are painted bright red into the paint stripper so I can remove the paint. Especially on the plastic lower part of the frame, the paint is a very thick coat and to be able to repaint it, I need to thin that down to make it look a bit better. More to come as they say on this project. Some fall colours for a brisk fall day. CN Train 399 drifts downhill at Milepost 30 on the Halton sub headed westbound on October 11, 2008. 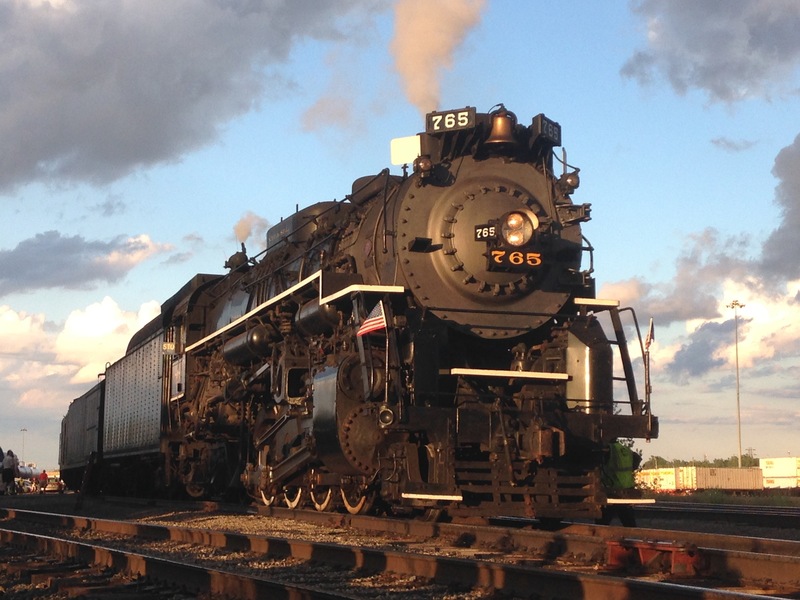 Nickel Plate Road #765 rests in Sloan Yard in Buffalo following an excursion from Buffalo to Corning New York and return on August 1, 2015. An autotrain in the Welsh Valleys. An ex-GWR pannier tank No 6430 in British Railways paint works a service on April 18, 2009 at Garthydwr on the Llangollen Railway during the Steel Steam & Stars 2 Gala. I also may be the only person who went on vacation to north Wales in April and got a suntan. The weather for the five days i was at the Llangollen was epicaly perfect for hiking and photographing trains!